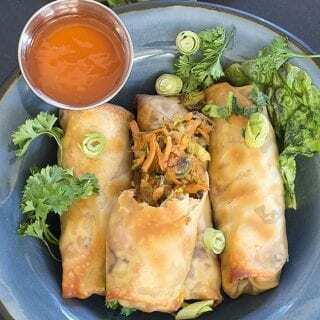 Baked vegan spring rolls made with Brussels sprouts and sweet potatoes. Quick and easy lunch recipe is a twist on the traditional Chinese recipe staple. For the longest time, I wanted to put Brussels sprouts and sweet potatoes together in a recipe! I was going to blend them together, one way or other! Because of this determination, I have spent countless hours of trying to figure out how these two would work together in a perfect taste harmony. There were pizza recipes, salads, sandwiches…. There was even the great burger debacle of 2016 where the burger tasted like burnt charcoal. Not even tomatoes could save it. It hurts just thinking about that recipe fail! So what did all those fails teach me? That I had to find a mediator that will make Brussels sprouts and sweet potatoes talk to each other! This moderator will be strong and not back down! After trying a few ingredients, I finally found the right ingredient for it. Yes, ginger has a strong flavor that adds to the Brussels sprouts dull flavor and tones down the sweetness of sweet potatoes. Together, all three were the perfect three’s company! 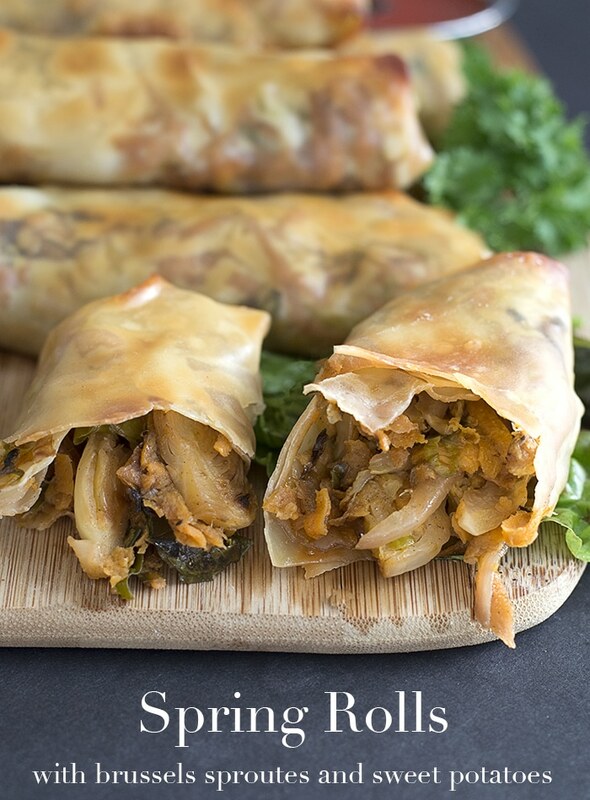 So, next time you are in the experimenting mood and want to try an easy vegetarian recipe, think of these spring rolls. 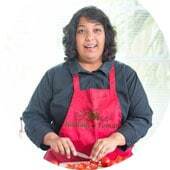 Best part is that you don’t have to fry them and stink up your whole house with hot oil! Bake them in the oven and your arteries will thank you! There are so many varieties for spring roll dipping sauces. You can make my apricot dipping sauce which is really easy to make. Or, you can put those sauce packets that you get from all those Chinese take outs to good use. I used sweet duck sauce as a dipping sauce and that was perfect. If you are brave, you can try it with the hot sauce packets. This is my best vegetarian spring rolls recipe every. It was my favorite experiment and I hope you like these spring rolls as much as I do. 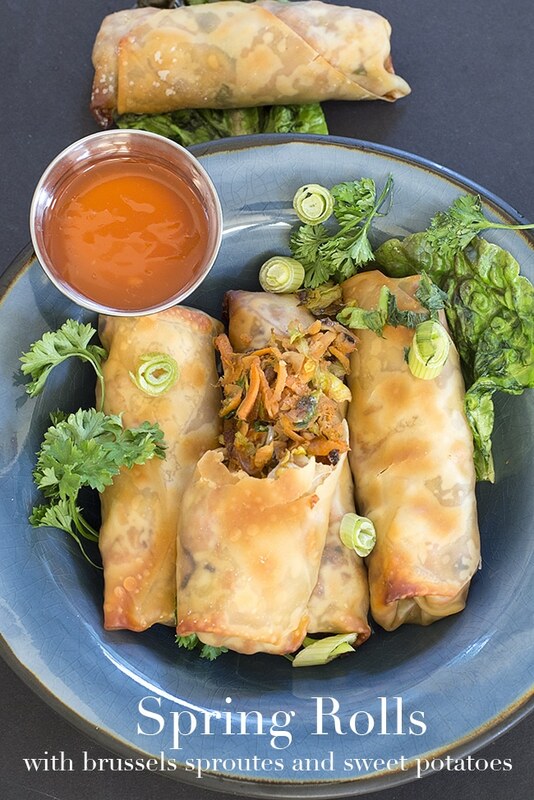 What is your favorite ingredient for spring rolls? Side note: My Tai-Pei mini rolls recipe directs to this post. Cook for about 2 more minutes. Continue stirring this time. Wet the edges of the unfolded parts of the wrapper. Then fold the left and right sides. Finally fold the top of the wrapper to close it. On a lightly oiled baking tray, place the spring rolls. Bake in the oven for about 7-10 minutes. When the top of the spring rolls has browned, remove from the oven and let it cool.